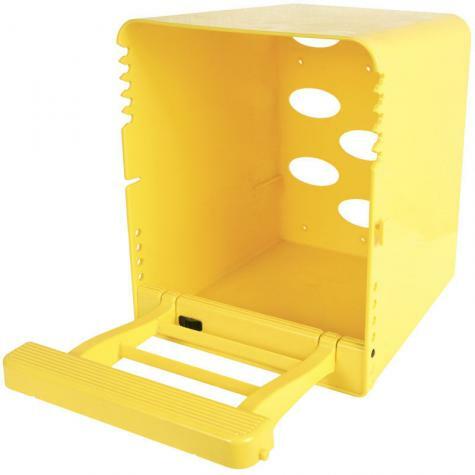 Innovative injection molded chicken nest box is draft free, but ventilated to keep the hens warm in winter and cool in summer. 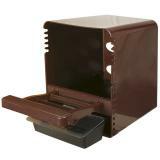 Replaces wood, metal and plastic nesting boxes. Our hens love this nesting box. (They prefer it over our other nesting boxes.) 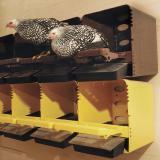 Roll-out tray prevents hens from eating the eggs. Manufactured with Natural Polypropylene Impact Copolymer that complies with FDA food additive regulation 21CFR177.1520(c)3.1a. Will not rot or rust like metal or wood laying boxes. Since it's injection molded, there are no cracks or crevices for poultry mites (red mites) to hide. 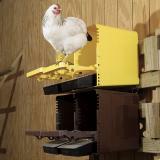 Fold-up perch is nifty front perch folds up to keep broody hens out at night. 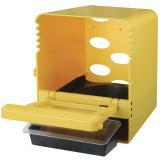 Perch also allows droppings to fall clear of the nesting area. The roll-out nest tray is optional. Speeds egg collection. Eggs stay clean (no droppings on them) and safe from pecking. Improves hygiene and speeds up egg collection. 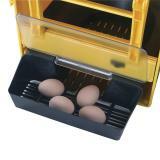 Keeps eggs cleaner as they roll away after being laid. Flap prevents any egg pecking or soiling. 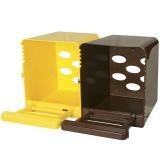 Interlocking system allows multiple boxes snap together with locking side tabs. Made of plastic—safer and easier to clean. Unlike metal it won’t rust and has no sharp edges. And unlike wood there are no splinters and it doesn’t harbor mites. 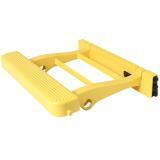 Can be easily hosed down with water and disinfectant for cleaning. Watch the assembly video and follow the printable instructions listed above. Hens refusing to use the roll-out tray? Add bedding. 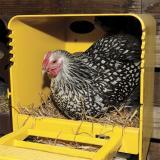 Once hens are accustomed to using the box, gradually remove bedding. Use ceramic nest eggs to encourage hens to lay in a specific area. Wooden nest eggs discourages egg eating. Recommended: 22 out of 25 said they would recommend this product to a friend. We found these to be easy to assemble and install into our coop. Just the right amount of bedding is needed with the roll out tray. Too much bedding will prevent the eggs from rolling into the tray, if there is too little bedding the hens may not choose to lay in the box. To prevent roosting, we installed a slanted board above the ChickBox. Very well made. Not sure worth the money. One of my chicken prefers a recycled avocado box and other uses the straw pile right now. But hopefully I can get my chickens to use these boxes. I do not think that whether my chickens use these should be part of the rating; it is not the boxes' fault. The four stars rating is for the expense - they are well made just expensive. Here are some tips on how to get hens to lay in a next box. • Try placing a ceramic or wooden nest egg in the box. 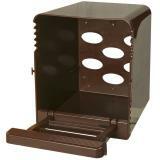 • Place a comfortable amount of clean bedding in the nesting box. Remove after they consistently lay in the box. • Locate nests in darker, secluded areas. Hens prefer to nest where they feel less visible to predators. Where and how high should the nest boxes be set up? 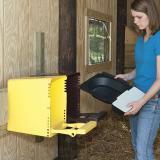 Place in corners or dimly lit areas of the coop, but make sure both you and your birds have easy access to the nest. 2 ft high at the base of the nest is reachable for most birds. Egg-stealing pests also have a harder time reaching this height. We’ve sold or used plastic, metal and wooden boxes over the years, with hundreds of chickens. Plastic is preferred because it doesn’t rot, is easy to clean, and lacks seams that mites or lice can hide in. 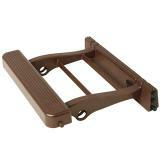 Hybrid metal/plastic units are a close second, combining metal’s durability and plastic’s quick cleaning. I've had these ChickBoxes for about 10 years now. I like them very much but I've had to replace the perches about every two years. They have made improvements on them but they still break at the ends that attach to the ChickBox. If they could only beef up the ends I could give them a 5 star rating but not until then. My girls got in the boxes right away. They knew what to do. Glad I got them. These are fantastic!!! I had a hen who had started eating the eggs. I've used these for a week, and no eggs eaten! Although I do have one holdout who is bound and determined to lay her egg on the floor underneath these new nests. But 1 out of 11 isn't bad. Eggs stay clean, and WHOLE! :-) For me, this was easy to switch out, changing from milk crates. Needed no extra space. If you plan to have hens for a long time, definitely a good investment. 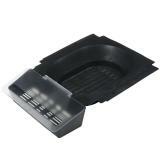 These trays work fabulous! Easy and fun project making brackets to retrofit them in our existing nesting boxes (it did however take more than a 4 degree slope). No big deal though, fixed that in a jiffy! It's my fault we had to purchase three of these fabulous trays. Klutzy me, dropped an egg at my feet and my sweet chickens turned into ravenous carnivores. We have not had a pecked or broken egg since we installed these trays in our nesting boxes..I fold 2 paper towels up in a 4" strip and lay in the end and bottom of each of the catch areas, Works perfect! Go ahead a make your purchase you will not be disappointed. They are made with sturdy, quality material. They will make their money back in no time. Eggs stay super clean as well!. You will not regret your purchase! Have a great day and enjoy those chickens! !